Hunting for whitetail deer is an exciting pastime that’s also a great way to provide quality meat for you and your family. Every hunter knows how to pick out a quality gun, and many take the time to learn how to effectively track deer, but not everyone bothers learning to call deer properly, or even to obtain a quality call. Deer calls are one of the most effective tools to use during a hunt, and it’s amazing what a good quality call can do for your hunting trip. After speaking with a buddy of mine who hunts similar areas that I do and seeing how many more opportunities he has thanks to a couple of quick deer calls, I realized just how important they are for good quality hunting. Now I spend time trying out different calls, and trying to find the very best of all. I’ve bagged many more deer since adding calls to my hunting kit. Let me help you find a quality call too, there’s no reason other people can’t share in my success, I’m certainly not having trouble bagging deer any longer, and my family gets a nice share of venison every year. Effectiveness – No matter what the call sounds like when you use it, it must be effective to be worth paying for. Each of the best calls around are highly effective when used right and can be used to bring in a variety of deer. Durable – While a call that works is very exciting to use out in the field, a call that falls apart midday is sure to ruin a good hunting trip, especially when that trophy buck goes sauntering by and you have no way to bring him within shooting range. Easy to adjust – If the call produces multiple sounds, and many do, it’s important that you can switch between them without a problem. I always take a moment to focus on how hard or difficult it is to move through the different call sounds. Cost – C’mon it’s just a call. Sure it’s going to up your hunting game, but that doesn’t mean you should spend a fortune on the accessory. There are plenty of affordable calls, and that’s what I’ll be focusing on. The Primos Hardwood Grunter call is a good solid tool that holds up better than many other calls over time. It’s pretty versatile and gives you many settings for doe and buck noises. One of the biggest pros about this call is that it can go quite loud, and it seems a bit more effective for calling in bucks that are farther off in the woods. I bring it out and use it when I’m really trying to reel them in for a good shot. My only qualm with this solidly built deer call is that it’s difficult to change between the settings. I love the sounds that it makes, but many people end up picking up two so they don’t have to worry about adjusting the o-ring and changing settings around in the field. It’s definitely not a call that you want to switch between sounds with regularly, which is fine for most people who know what they are doing, or for those with two of the calls. 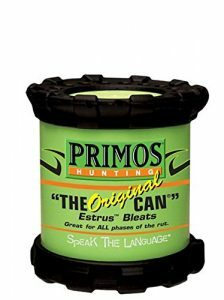 This can call from Primos is a common tool that most hunters carry around with them, and there’s a reason for that, it works exceedingly well for what it does. I have one with me most of the time mid-season when it begins to be most effective overall. The can produces a very realistic doe bleat, and it’s just the thing you need to bring big bucks in. It’s easy to learn to use, and a good solid option for beginners that don’t need to many options. 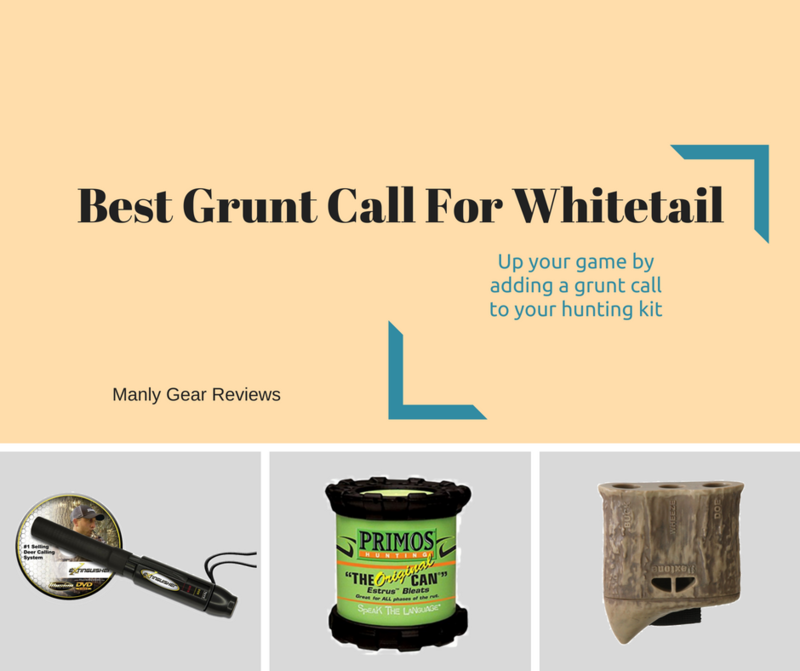 While the more complicated calls are good to have, especially when you want options, if you’re new to hunting this is the call to get. It’s excellent and you won’t have to worry about getting it right, it’s almost foolproof. 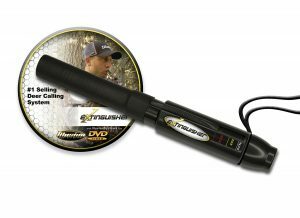 With the Flextone Bone Collector call you have a versatile tool at your disposal. It can handle fawn, doe and buck sounds, and it’s easy enough to adjust the reed for different tones as well to really get control over the size you are trying to mimic. It’s a pretty affordable tool and is pretty simple to use after a bit of practice. The most difficult thing is switching from one sound type to another, but even this can be mastered in a couple practice sessions. The call is good for before the rut or during it, and it’s a tool that you’ll be glad to have with you. It’s quite lightweight and comfortable to use, and has a nice smooth action that you don’t find on all calls of this type. Deer calling is a bit of an art form and something that you’ll have to practice at home and adjust out on the hunt. This Extinguisher Deer call makes doing all that pretty easy. It comes with a straightforward DVD showing you how to do the calls properly. After practicing for just a few minutes I had most of the calls down, granted I’ve used calls before, but it was still quite simple. My son, who is new to calls was able to produce realistic sounds with it as well. One thing that I really enjoy about this call is how easy it is to switch between sounds and to even adjust those sounds for size. You can create a small or large buck grunt, then bump it over to a doe bleat in a matter of seconds. It’s a simple thing to switch sounds when one isn’t effective, and you’ll have more opportunities to bring those bucks and does in close with this. 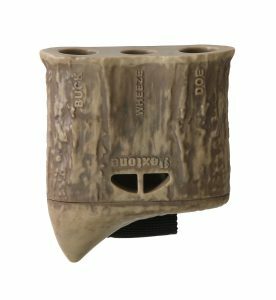 This True Talker deer call from Hunters Specialties is a thing of beauty. It makes a full range of deer sounds that will get the attention of that trophy winning buck, I know because I bring it out in the woods with me almost every time I go out. It’s smooth and easy to use, but it’s important that you break it in with lots of practice calls first and foremost. The call isn’t reliable until after it’s broken in. Once it’s nicely worn in you can do a Doe bleat, a dominant buck, a fawn and everything in between with this nice little tool and the low price tag is nice too.